ReplaceMagic.Project is used by IT staff to fix broken links in your Microsoft Project documents when server gets renamed, to change header/footer when for example contact details are changed, by translators and other people who need to do massive search/replace in MS Project documents. 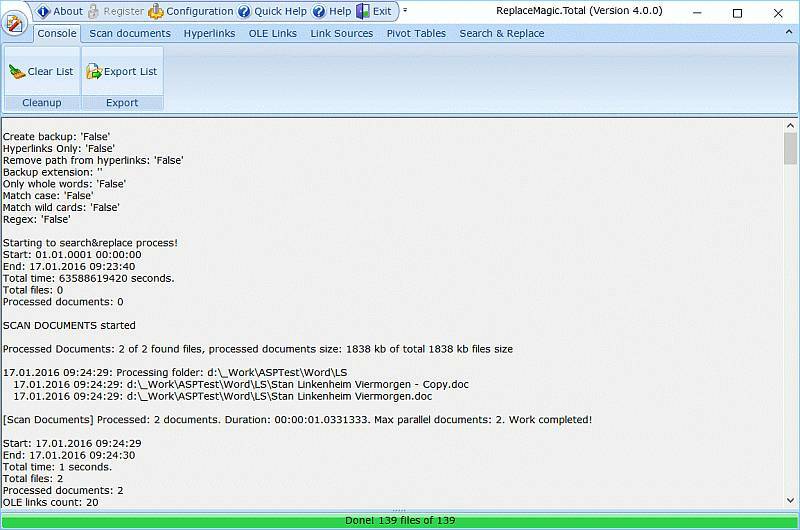 ReplaceMagic.Office is complete solution to fix broken links or OLE object links in your Office documents. This version covers Excel, Word, PowerPoint, Visio, Project and OneNote documents. With ReplaceMagic.Excel you can make changes in Excel documents. It is not important is this header/footer/VBA/hyperlinks or any other document area, we cover almost everything. ReplaceMagic.Word is used when you need to fix broken hyperlinks, OLE object links, link sources or texts in Word documents. ReplaceMagic.PowerPoint is used when you need to fix broken hyperlinks, OLE object links, link sources or texts in PowerPoint documents. ReplaceMagic.Visio is used when you need to fix broken hyperlinks, OLE object links, link sources or texts in Visio documents. ReplaceMagic.Project is used when you need to fix broken hyperlinks, OLE object links, link sources or texts in Project documents. 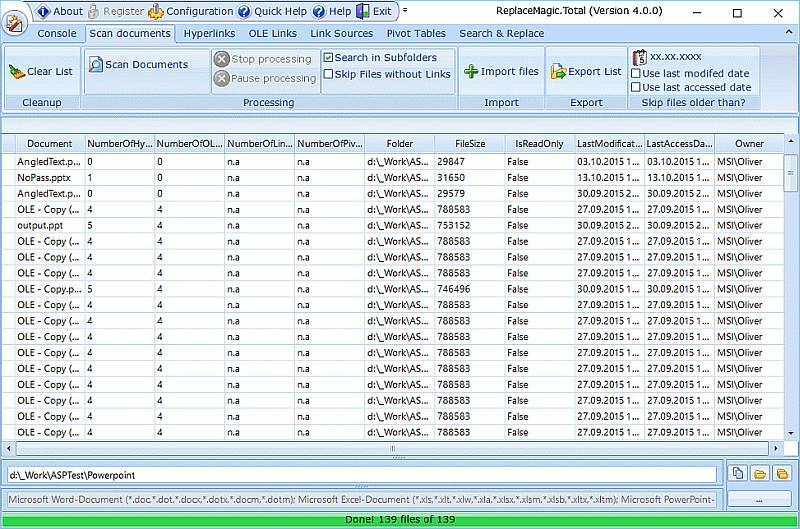 ReplaceMagic.LNK is used when you want to fix Windows shortcuts (*.lnk files). ReplaceMagic.PDF is used when you want to fix PDF documents. ReplaceMagic.OneNote is used when you want to fix OneNote documents. ReplaceMagic.Total is used when you want to fix Office (Word, Excel, PowerPoint, Visio, Project and OneNote) and PDF documents. ReplaceMagic.Ultimate is used when you want to fix Office (Word, Excel, PowerPoint, Visio, Project and OneNote), PDF, Text (txt, csv, html and custom) and LNK documents. 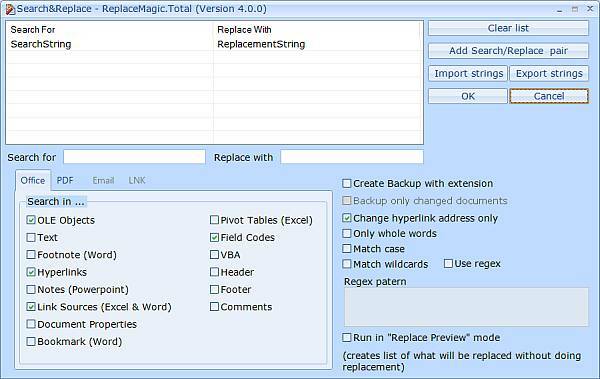 ReplaceMagic.Text is used when you want to make changes in text documents with extensions like txt, csv, html. Also you can add your custom extensions.